I WAS with my wife in Somerset for a couple of days last week when a man strode into our offices in Branch Road, Batley. The staff downstairs are all female, and the man came straight beyond our reception counter. The man was Mark Townsend, home affairs editor of The Observer, the Sunday sister title of the socialist Guardian newspaper. He was on a mission – to settle some old scores on behalf of Batley and Spen has-beens. 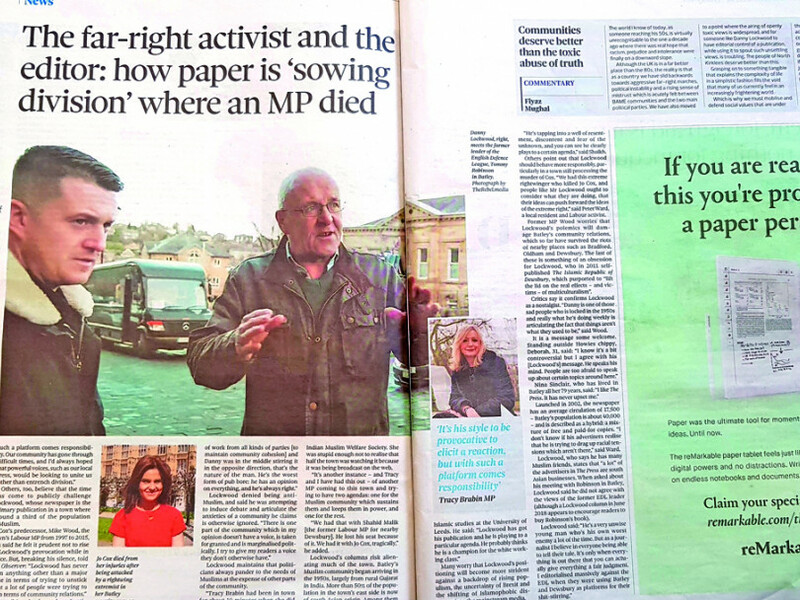 My sins as a columnist – they mistakenly called me the editor, but that’s the Grauniad/Obverser for you – were to ridicule the niqab and, so they claimed, to be sowing division in a town still “raw from the murder of Jo Cox”. Where have they been all these years, was my first reaction? Another sin was to be interviewed by self-styled citizen-journalist Tommy Robinson – in broad daylight, in the middle of Batley – although there was nothing controversial said in that. For the record, I’ve also co-operated with The Times, Independent, Guardian – yes! – Daily Mail, BBC (often), Asian News Network, Russia Today, Agence France Presse, numerous freelances and others I’ve missed. Ultimately, Townsend did a more balanced job than I expected. What made me chuckle though, was the names of my antagonists – former Labour MP Mike Wood, and his erstwhile right-hand man Peter Ward. There was also a snide attack from Fiyaz Mughal of the racist Tell MAMA group whose chairman is old friend Shahid Malik. Long before Malik was caught with his fingers in the MPs’ till, this newspaper was exposing how MP Wood was milking the Westminster system for all it was worth. Guess who was feeding us that information? None other than Labour man Peter Ward, whom Wood had discarded. Anyway, they hurled their sticks and stones – but of more concern to me at first reading was the comment from current MP Tracy Brabin. “I understand that it’s his style to be provocative to elicit a reaction, but with such a platform comes responsibility,” said Tracy. Now firstly, that’s fair. But what either she didn’t mention, or The Observer didn’t know, was that Tracy isn’t so offended that she won’t write a regular column for us. The mystery was soon revealed, however, when her office sent us the full quote. Only a selective snippet was used. Here’s what The Observer omitted: “The news pages of The Press ... are informative and comprehensive. There’s no denying that it provides a valuable local news service, one that many communities simply don’t have. “In that respect, Batley and Spen is lucky to be served by a number of high quality news outlets. Again, balanced and fair criticism, so thank you Tracy. If I haven’t upset everyone who reads my stuff at some time or another, then I’m losing my touch. And that’s the point. Anyone pretending there aren’t serious problems in this district becomes part of the problem. Sure, newspapers love to accentuate the positive; that’s a huge part of the job. But hiding from uncomfortable truths, and suppressing the legitimate concerns of ordinary people – of all communities – adds to that problem. If people can get things off their chest, it’s cathartic, it lowers the pressure, not builds it up to boiling. At least that’s my view, one which I hope the writer of our last two Letters of the Week Elyas Patel appreciates.